As mentioned earlier, I am a trashcan enthusiast, for its ability to reveal household to company philosophy. It was while taking out the trash, I realized that a sizable portion of it was various shampoo and body wash bottles. I did not like it, and thus germinated the idea of rethinking bath products. However, it took a good few years to switch from multiple petroleum goop to fewer goop to paper-wrapped-yet-dubious-ingredients-laden bar shampoo to pantry staples. It has been about four months since I have used shampoo (except for when I went for a haircut) or body wash and my dreadlocks are forming nicely. Image (above): About three months into the new regimen. Perhaps my scalp has developed a layer of earthy sediment. Or maybe not. Our rural counterpart still use ‘khoil’ (mustard skin), a byproduct of mustard oil, in lieu of shampoo, with much success. The same ‘khoil’ that is also used as livestock feed. What a beautiful zero waste system! Obviously, I do not have access to khoil or soapnuts or river clay-all of which are excellent cleanser, I hear. In the urban jungle, I use whatever is available in the pantry. This is not a new concept. I vaguely remember reading about cheap shampoo substitutes on local weekend newspaper as a kid. I have used egg(the yolk as cleanser, white as conditioner), red lentil powder, gram flour, flour, rice flour – one at a time. The latter two were utilized because an ambitious pitha project was abandoned midway and I did not have the heart to throw away the wheat and rice flour batter! They all clean both hair and body nicely. Very nicely. 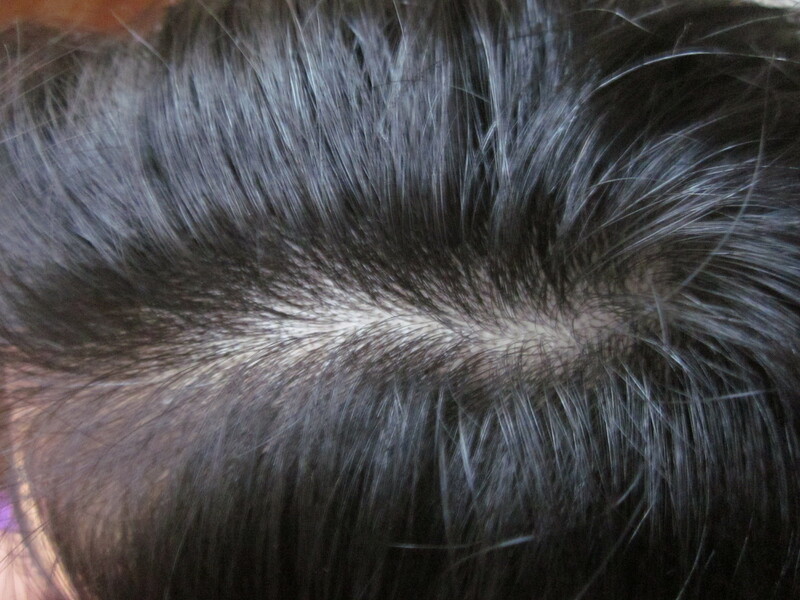 No slimy residue, no eventual build up, no dandruff, no itchy scalp, no tangle and no lingering stench. They could leave granules (in case of red lentil powder or rice flour) if not washed well, but nothing a thorough brushing while in the shower with a wide tooth comb wouldn’t solve. For conditioner, apple cider vinegar works really well. 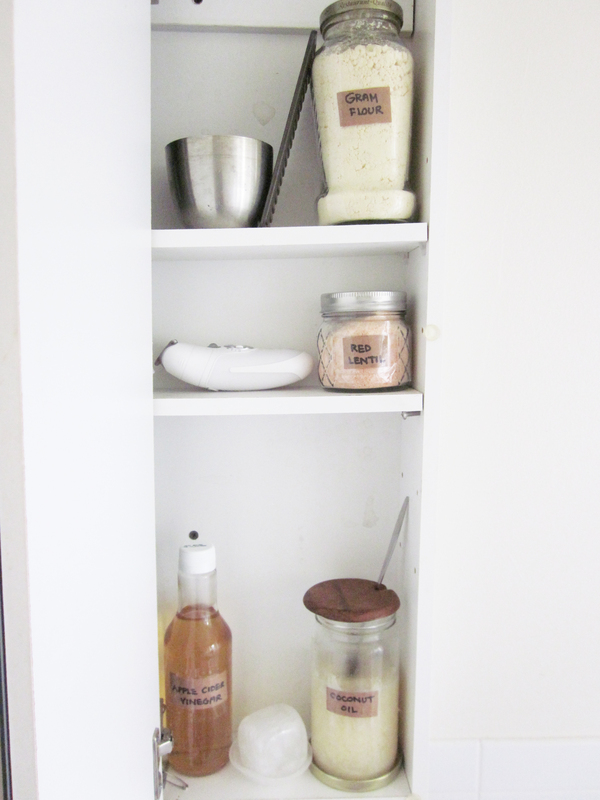 Image (above): On the top shelf is a jar of gram flour for cleaning both hair and body. On the second shelf- dry, granulated red lentil (powdered in a blender) for days when I do not have lentil rinse water on hand. I mix in the red lentil powder with water in the stainless steel tumbler and brush clean with a wide tooth comb. On the bottom shelf- apple cider vinegar for conditioner. Coconut oil for occasional face/body scrub (mixed in with salt or sugar or anything granulated) and for oil pulling. Also there, an alum stone for deodorant. 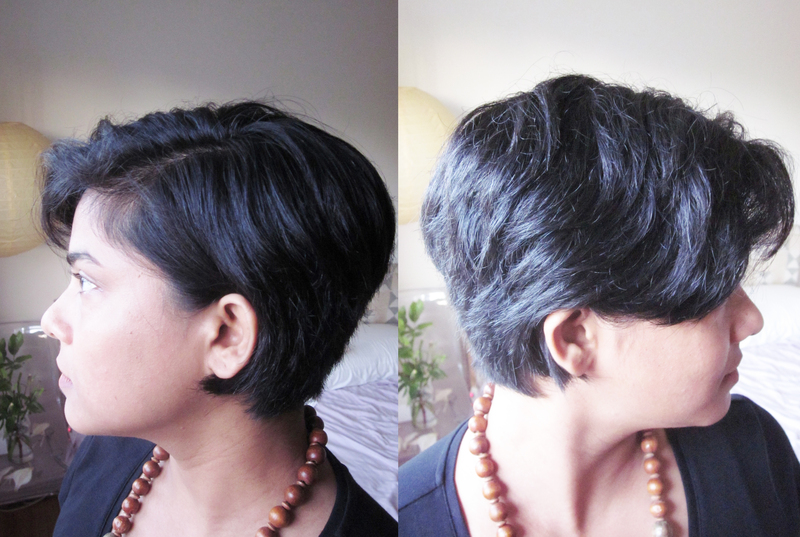 So far, my hair is in its best behavior when cleansed with egg and then washed with lentil water. In my case, egg makes the hair greasier than I would like. The lentil water helps take the excess grease off. Another vegan combo that works really well, gram flour or red lentil for cleansing, paired with an apple cider vinegar rinse for conditioner. I realized about the cleansing property of lentil while I was washing lentils for cooking and noticed how the hands felt squeaky clean. The perks of mindful living! Image (above): Leave an egg very precariously on the sink, at all times. On the right, water from rinsing the lentil saved, either to be used immediately or to be stored in the fridge for later. These pantry staples do not create problematic waste and pollute groundwater with toxins. They do not have sinister product traits that enslave the consumer. Have you noticed how store-bought shampoo renders the hair greasy in two days? This is the result of sinister product engineering. Shampoo strips hair off of sebum (natural oil in the scalp), then the scalp produces more oil to compensate, you need more shampoo to take the excess oil off. You get the idea. I can now easily go up to ten days without washing my hair. More example of sinister product engineering: body wash that dries the skin excessively to necessitate the use of body lotion; engineered food products that make the consumer hungrier, thirstier and generally needier. The options mentioned above need some initial working out the proportions and a system to suit individual needs. I am still tweaking the combination that requires minimal logistics but yields best outcome. However, I consider myself to be already ahead when I do not have to pay a multinational to paralyze me with rows upon rows of insecurities. The hair and beauty product isle is yet another isle in the super market, that I can blissfully stay out of. That is peace, in the guise of civil disobedience, in my book.